Truck dealership Rush Enterprises posted higher third-quarter net income and revenue on the strength of its aftermarket and used truck activities as sales of new heavy-duty trucks fell due to the timing of large orders. For the period ended Sept. 30, the nation’s only publicly traded commercial vehicle dealership posted net income of $41.7 million, or $1.03 per diluted share, compared with $29.8 million, or 72 cents, a year earlier. Revenue rose to $1.38 billion compared with $1.26 billion in 2017. Aftermarket products and services accounted for 63.6% of the company’s total gross profits in the third quarter, with parts, service and body shop revenues up 13.6% compared with the third quarter of 2017. This contributed to a quarterly absorption ratio of 122.4%, according to San Antonio-based Rush. Parts, service and body shop revenues were $426.8 million in the third quarter of 2018, compared to $375.8 million in the third quarter of 2017. Its aftermarket performance was driven by economic strength and activity throughout the country, particularly in the energy, refuse and construction market segments. “When it comes to the parts side, I’ve got things rolling out right now that I won’t get into, but we continue to invest in technology and tools to put into the hands of our people. You know, the best information, data and guidance to guide action,” Rush Chairman and CEO W.M. “Rusty” Rush said during an earnings call. In the quarter, Rush launched its second All-Makes Parts catalog and opened four locations in the southern United States. 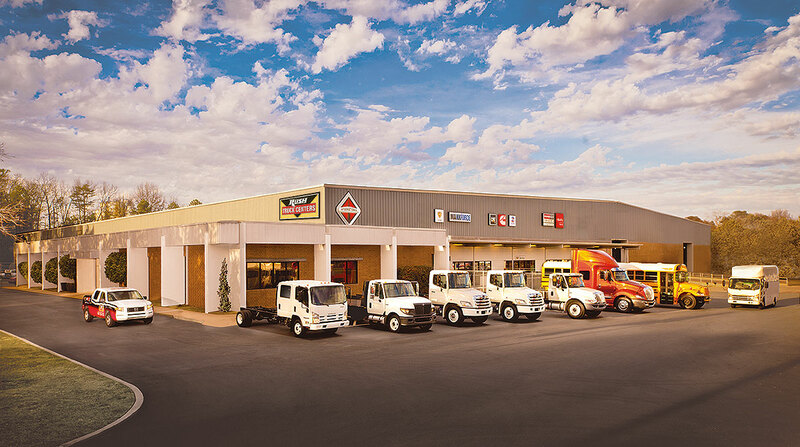 “These new locations expand our support to customers by providing commercial vehicle parts and services as well as used truck sales in two of the four locations,” Rush said. At the same time, the company added nearly 60 basic-level service technicians to dealerships around the country in the quarter and has a project underway to increase the hours of operation throughout its dealership network. Meanwhile, used vehicle revenue jumped 32% to $97.5 million compared with $73.7 million a year earlier as sales increased 26%. “Extended lead times for new Class 8 trucks are bolstering the used truck market, helping to stabilize used truck values and decreasing the impact of the large volume of used trucks entering the market,” he said. Sales of new heavy-duty trucks in the quarter slipped to $501 million compared with $515 million a year earlier. The company sold 3,325 Class 8 trucks in the third quarter, or 4.8% of the total U.S. Class 8 truck market. Truck sales fell year-over-year because of new-vehicle supply chain constraints, in addition to fleets’ timing issues, Rush said. “And it’s not just one original parts manufacturer. If you go back a few decades, there were many suppliers,” Rush said. “There’s consolidation of the supplier base for the OEMs. I don’t care which [truck] brand you are talking about, they all get the same panels and things like that when I am talking about interior pieces, from the same folks. And there was a large bottleneck. ACT Research Co. forecasts U.S. retail sales for Class 8 vehicles to be 254,100 units in 2018, a 28.8% increase compared with 2017, he said. Rush’s long-term goal is to grow annual revenue to $7 billion by 2022. The company has 100 dealership locations in 21 states. They represent Class 8 trucks from Peterbilt Motors Co. and International Truck as well as medium-duty and bus brands.